Astrophotographer Anthony Lopez sent in a photo of the full moon taken in Juarez, Chihuahua, Mexico, close to the US border, on May 26, 2013. He writes: "Around my yard stands a perimeter fence of just over 3 meters high that hides the street lights almost completely, leaving only the light of the full moon to illuminate the place where I set my telescope. I mount the camera, pressed the shutter and there she is, our moon, beautiful and photogenic, wearing her best craters for me ... "
The moon is the easiest celestial object to find in the night sky — when it's there. Earth's only natural satellite hovers above us bright and round until it seemingly disappears for a few nights. The rhythm of the moon's phases has guided humanity for millennia — for instance, calendar months are roughly equal to the time it takes to go from one full moon to the next. Moon phases and the moon's orbit are mysteries to many. For example, the moon always shows us the same face. That happens because it takes 27.3 days both to rotate on its axis and to orbit Earth. We see either the full moon, half moon or no moon (new moon) because the moon reflects sunlight. How much of it we see depends on the moon's position in relation to Earth and the sun. Though a satellite of Earth, the moon, with a diameter of about 2,159 miles (3,475 kilometers), is bigger than Pluto. (Four other moons in our solar system are even bigger.) The moon is a bit more than one-fourth (27 percent) the size of Earth, a much smaller ratio (1:4) than any other planets and their moons. This means the moon has a great effect on the planet and very possibly is what makes life on Earth possible. There are various theories about how the moon was created, but recent evidence indicates it formed when a huge collision tore a chunk of Earth away. The leading explanation for how the moon formed was that a giant impact knocked off the raw ingredients for the moon off the primitive molten Earth and into orbit. Scientists have suggested the impactor was roughly 10 percent the mass of Earth, about the size of Mars. Because Earth and the moon are so similar in composition, researchers have concluded that the impact must have occurred about 95 million years after the formation of the solar system, give or take 32 million years. (The solar system is roughly 4.6 billion years old.) New studies in 2015 gave further weight to this theory, based on simulations of planetary orbits in the early solar system, as well as newly uncovered differences in the abundance of the element tungsten-182 detected in the Earth and the moon. Although the large impact theory dominates the scientific community's discussion, there are several other ideas for the moon's formation. These include that the Earth captured the moon, that the moon fissioned out of the Earth, or that Earth may even have stolen the moon from Venus, according to a recent theory. 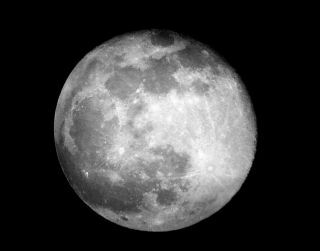 The moon very likely has a very small core, just 1 to 2 percent of the moon's mass and roughly 420 miles (680 km) wide. It likely consists mostly of iron, but may also contain large amounts of sulfur and other elements. Its rocky mantle is about 825 miles (1,330 km) thick and made up of dense rocks rich in iron and magnesium. Magmas in the mantle made their way to the surface in the past and erupted volcanically for more than a billion years — from at least four billion years ago to fewer than three billion years past. The crust on top averages some 42 miles (70 km) deep. The outermost part of the crust is broken and jumbled due to all the large impacts it has received, a shattered zone that gives way to intact material below a depth of about 6 miles (9.6 km). The average composition of the lunar surface by weight is roughly 43 percent oxygen, 20 percent silicon, 19 percent magnesium, 10 percent iron, 3 percent calcium, 3 percent aluminum, 0.42 percent chromium, 0.18 percent titanium and 0.12 percent manganese. Ongoing observations from the Lunar Reconnaissance Orbiter (LRO) showed that water is more abundant on slopes facing the lunar south pole, although scientists do caution that the water quantity is comparable to an extremely dry desert. Meanwhile, a 2017 study suggested the moon's interior could be abundant in water, too. The moon has a very thin atmosphere, so a layer of dust — or a footprint — can sit undisturbed for centuries. And without much of an atmosphere, heat is not held near the surface, so temperatures vary wildly. Daytime temperatures on the sunny side of the moon reach 273 degrees F (134 C); on the dark side it gets as cold as minus 243 F (minus 153 C). The moon's gravity pulls at the Earth, causing predictable rises and falls in sea levels known as tides. To a much smaller extent, tides also occur in lakes, the atmosphere, and within Earth's crust. High tides are when water bulges upward, and low tides are when water drops down. High tide results on the side of the Earth nearest the moon due to gravity, and it also happens on the side farthest from the moon due to the inertia of water. Low tides occur between these two humps. The pull of the moon is also slowing the Earth's rotation, an effect known as tidal braking, which increases the length of our day by 2.3 milliseconds per century. The energy that Earth loses is picked up by the moon, increasing its distance from the Earth, which means the moon gets farther away by 1.5 inches (3.8 centimeters) annually. The moon's gravitational pull may have been key to making Earth a livable planet by moderating the degree of wobble in Earth's axial tilt, which led to a relatively stable climate over billions of years where life could flourish. The moon doesn't escape from the interplay unscathed. A new study suggests that Earth's gravity stretched the moon into its odd shape early in its lifetime. A solar eclipse occurs when the moon gets directly or nearly directly between the sun and Earth, and the moon's shadow falls on us. A solar eclipse can occur only during a new moon. Solar eclipses are rare in a given location because the shadow of the moon is so small on the Earth's surface. The last total solar eclipse in the United States happened in Aug. 2017, and the next one will take place in April 2024. Skywatcher Nick Rose took this photo of the total lunar eclipse Dec. 10 from Millbrae, California. The Earth's axis of rotation is tilted in relation to the ecliptic plane, an imaginary surface through Earth's orbit around the sun. This means the Northern and Southern hemispheres will sometimes point toward or away from the sun depending on the time of year, varying the amount of light they receive and causing the seasons. The tilt of Earth's axis is about 23.5 degrees, but the tilt of the moon's axis is only about 1.5 degrees. As such, the moon virtually has no seasons. This means that some areas are always lit by sunlight, and other places are perpetually draped in shadow. Some ancient peoples believed the moon was a bowl of fire, while others thought it was a mirror that reflected Earth's lands and seas, but ancient Greek philosophers knew the moon was a sphere orbiting the Earth whose moonlight reflected sunlight. The Greeks also believed the dark areas of the moon were seas while the bright regions were land, which influenced the current names for those places — "maria" and "terrae," which is Latin for seas and land, respectively. The pioneering astronomer Galileo Galilei was the first to use a telescope to make scientific observations of the moon, describing in 1609 a rough, mountainous surface that was quite different from the popular beliefs of his day that the moon was smooth. In 1959, the Soviet Union sent the first spacecraft to impact the moon's surface and returned the first photographs of its far side. This spurred a series of uncrewed missions by both the Soviet Union and the United States to observe the moon's surface. Many of these first probes were failures or only partially successful. However, over time, these early probes returned information about the moon's surface and geological history. The United States launched a series of Pioneer, Ranger and Surveyor missions, while the Soviet Union sent probes under the names Luna and Zond. Luna 2 was the first spacecraft to impact the moon in 1959. The first soft landing was achieved in 1966, by Luna 9. The United States sent astronauts to the moon's orbit and surface in the 1960s and 1970s. The first mission to the moon was in 1968, when the Apollo 8 astronauts orbited it. In 1969, Apollo 11 landed the first astronauts on the moon, undoubtedly the most famous of NASA's achievements, followed by five more successful missions (and one, Apollo 13, that didn't make to the moon). Their efforts returned 842 lbs. (382 kg) of rocks and soil to Earth for study. It remains the only extraterrestrial body that humanity has ever visited. Scientists continue to study the rocks, and have made new discoveries as technology improved. For example, in 2013, water was found in samples from Apollo 15, 16 and 17 – an interesting find given that previous analyses showed these rocks were quite dry. While crewed lunar missions concluded in 1972, robotic exploration continued. The Soviet Union remained active in robotic lunar exploration through the 1960s and 1970s, even as the Apollo astronauts landed there. The first lunar sample return mission took place with Luna 16 in September 1970, after multiple failed attempts with other missions. The Soviets also deployed the first robotic lunar rover, called Lunokhod 1, just two months later. Lunokhod 2, which deployed in 1973, set an off-world distance driving record for more than 40 years, until the long-running Mars Opportunity rover mission surpassed it in 2014 after several years of driving. After an interlude of more than a decade, U.S. lunar exploration resumed in the 1990s with the robotic missions Clementine and Lunar Prospector. Both missions suggested water might be present at the lunar poles, hints the joint launch of the LRO and the Lunar Crater Observation and Sensing Satellite (LCROSS) helped prove were real in 2009. Also in the 1990s, other space programs had advanced enough for new nations to begin exploring the moon themselves. The first successful Japanese mission, Hiten or MUSES-A, took place in 1990. The European Space Agency sent its first mission, SMART-1, in 2003, and China's Chang'e 1 followed in 2007. India launched Chandrayaan-1 in 2008, but controllers lost contact with the spacecraft in 2009. In 2013, China made history by landing a robotic rover on Earth's satellite. In 2011, LRO sent back the best moon map ever. Its high-resolution images of the moon's surface not only provided information about water and geology, but also pictures of the landing and crash sites of various spacecraft and rocket parts. A NASA radar technique used by Earth radio telescopes also found India's Chandrayaan-1 spacecraft in 2017. Other recent missions of NASA include Gravity Recovery and Interior Laboratory (GRAIL), which examined the moon's gravity field, and the Lunar Atmosphere and Dust Environment Explorer (LADEE). Countries aren't the only entities exploring the moon. In 2014, the first private moon mission launched to study the moon. Private exploration may be the first step in the process of mining the moon, though ownership and legalities remain controversial. Additional reporting by Elizabeth Howell and Nola Taylor Redd, Space.com contributors.